My latest article for The Outlook magazine, entitled “How to Evade the Worship Wars,” is now available online. The article summarizes the regulative principle of worship and the dialogical nature of worship, as well as applying them to some common questions about worship styles in Reformed churches. It’s a follow-up of sorts to our “A Look at Liturgy” series here on URC Psalmody. If you’re interested, check it out! 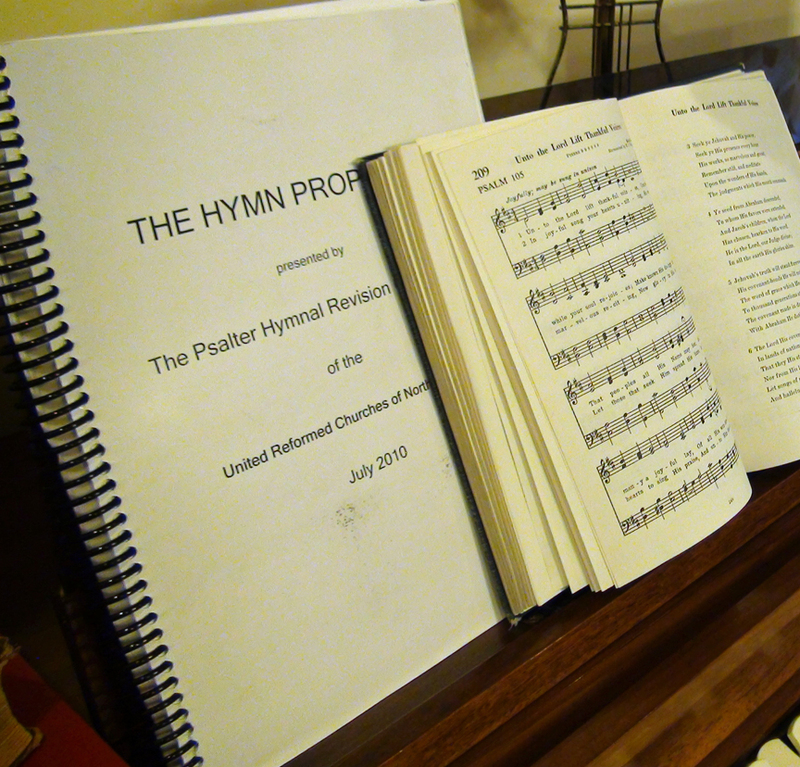 On May 15, the joint OPC and URCNA Psalter Hymnal Committees released the sheet music for the proposed hymn section of the new songbook online at www.psalterhymnal.org. The collection replaces the first hymn proposal prepared by the URC Psalter Hymnal Committee in 2010. Added to the approximately 270 psalm settings approved by both denominations last year, the new Hymn Proposal’s 428 selections would yield a songbook significantly larger than the current Psalter Hymnal used in the URCNA, but comparable in size to the OPC’s red Trinity Hymnal. With titles like “A Mighty Fortress Is Our God,” “Abide with Me,” “Holy, Holy, Holy,” and “It Is Well,” a large portion of the Hymn Proposal will be familiar to the average hymn-singing church member. Several psalm paraphrases from the blue Psalter Hymnal that were omitted from the Psalm Proposal also appear here in the hymn section, including familiar titles like “Christ Shall Have Dominion,” “In Doubt and Temptation,” and “On the Good and Faithful.” Many selections were scanned directly from the pages of the blue Psalter Hymnal and red Trinity Hymnal, appearing with little or no textual or musical alterations. Consistent with the Reformed tradition in the heritage of the Synod of Dort, the Hymn Proposal includes settings of the New Testament songs of Mary, Zechariah, and Simeon. Other notable selections include a musical version of the Ten Commandments, two versions of the Lord’s Prayer, two hymns based on the Apostles’ Creed, and a musical setting of the first question and answer of the Heidelberg Catechism. The Psalter Hymnal committees will receive feedback on the contents of the hymn section of the new songbook via email at comments@psalterhymnal.org until December 31, 2015. The finished collection will be presented for approval to the OPC’s General Assembly and the URCNA’s Synod in 2016, Lord willing, with publication to follow. We’ve already worked through the question of why Christians should sing. If we view congregational singing as the grateful offering of redeemed sinners before a holy God, we should also carefully consider what to sing. Simply put, we should strive to make sure we worship God the way he desires to be worshiped. Now while most Reformed Christians (and, indeed, Christians in general) would agree that these are good requirements, they have long disagreed about which songs best fit them. The Orthodox Presbyterian Church (OPC) encourages the use of both psalms and hymns (that is, any songs from outside or from other portions of Scripture) in worship services. However, with the decision to produce a complete Psalter Hymnal in collaboration with the United Reformed Churches in North America, the OPC took one step further. In so doing it affirmed that all of the psalms (not just some of the psalms) are appropriate for Christians to sing, and that their nature and purpose are distinct from those of uninspired hymns. I heartily agree with this position. And while I’m not here to argue that the psalms should be sung exclusively, I do want to spend the rest of this class outlining how the Book of Psalms is supremely suitable and helpful for Christian worship. In particular, there are three primary ways in which psalm-singing offers a fuller and richer experience than hymn-singing. First, when we sing psalms we sing the inspired Word of God itself (though usually adapted to fit a rhymed metrical pattern). You can’t get more “in accord with the Scriptures” than the Scriptures themselves! As long as the translators and versifiers have done their job well, we never have to worry about singing psalms that promote false doctrine. Psalm-singing immerses us in the Word of God to an extent that hymns do not. Even though the psalms were written thousands of years ago, through the Holy Spirit they speak to believers today just as powerfully as they did then. In fact, aspects of some psalms still remain unfulfilled—for instance, the prophecies about the blessings of the Messiah’s reign over all the earth in Psalm 72. We find that we must sing the psalms with the same eyes of faith as our forefathers did. Third, when we sing psalms we sing not just to Jesus and about Jesus, as we do with hymns, we also sing with Jesus (a distinction helpfully brought out in David Murray’s book Jesus on Every Page). Opponents of psalm-singing often argue that as part of the Old Testament, the psalms fail to incorporate the revelation of the person and work of Jesus. But while there are two testaments, there is only one redemptive story, and Christ is at its center. Murray and others have made a convincing case for reading the psalms as they would have been sung by Jesus himself. As an example of singing the psalms with Jesus, look at Psalm 22. The opening words of this psalm should be familiar to all of us: “My God, my God, why have you forsaken me?” They were, of course, spoken by Jesus as he hung on the cross. But look at the last verse of this psalm: “They shall come and proclaim his righteousness to a people yet unborn, that he has done it.” Some theologians have suggested that this last phrase could also be translated, “It is finished.” From beginning to end, Psalm 22 reflects the thoughts and words of Jesus as he suffered for our sins. In that sense, we see this psalm as being sung by him! This becomes even more awe-inspiring when we see Jesus singing about us in the second half of this psalm: “All the ends of the earth shall remember and turn to the LORD, and all the families of the nations shall worship before you” (v. 27). With this perspective, isn’t it an incredibly rich and rewarding experience to study and sing this psalm? As we close, I’d simply like to ask you to learn to love the psalms God has provided for us in his Word. Learn to love reading them, studying them, seeing Christ in them, and singing them. Learn to let this book shape your expressions of praise and gratitude to God. Individually and as a church body, you will find that the psalms nourish and strengthen your spiritual walk as a result. Welshman John Hughes’ 1905 tune CWM RHONDDA is most often associated with the hymn “Guide Me, O Thou Great Jehovah,” but it makes a great fit for the text of Psalm 122. Not only does it convey the psalm’s jubilant enthusiasm, it also evokes climbing hilly terrain to reach a long-sought destination—in this case, Mount Zion, the city of God. Speaking of hilly terrain, this setting of Psalm 122 provides numerous crags and corners that make singing it challenging but rewarding. Look out for slight rhythmic differences between the vocal parts, the repetition of one phrase (“We were standing! We were standing!”), and an alto/bass echo before the final line. Hold the fermata in the third-to-last measure as long as feels natural before continuing triumphantly on to the end of the stanza. As you sing Psalm 122A, let your heart fill with gladness at the opportunity to go up to God’s house with his people and worship him there. Psalm 122 refers to the temple as “the house of the Lord” (v. 1)—the dwelling-place of God among his people. But what the temple foreshadowed, Christ incarnated. He is Emmanuel, “God with us.” Amidst the rampant strife of a fallen world, the psalmist’s prayer “Peace be within you!” (v. 8) offers a foretaste of the angels’ joyful announcement when Jesus was born: “Peace on earth!” (Luke 2:14). Praise God for the peace that Jesus came to bring! When Jesus drove the merchants and money-changers out of the temple, John notes that the disciples connected his actions with the fulfillment of another passage from the psalms, Psalm 69:9: “Zeal for your house has consumed me” (John 2:17). With this zeal Christ came to ransom “people for God from every tribe and language and people and nation” (Rev. 5:9). Through his work of redemption we are adopted as “heirs of God and fellow heirs with Christ” (Romans 8:17), becoming his “brothers and companions” (Psalm 122:8). Now “the house of the Lord” takes on an entirely new meaning: Peter writes that we “like living stones are being built up as a spiritual house, to be a holy priesthood, to offer spiritual sacrifices acceptable to God through Jesus Christ” (I Peter 2:5). Because Christ sought the good of his people (Psalm 122:9) we have the privilege of seeking the good of his Church. Are you glad to be called to worship in the house of the Lord (v. 1)? What hinders the church from being “bound firmly together” (v. 3)? How should we seek unity with the rest of the visible church? What are some practical ways you can seek the good of the people of God (v. 9)? First we love [the church] and then we labor for it, as in this passage; we see its good, and then seek its good. If we can do nothing else we can intercede for it. Our covenant relation to Jehovah as our God binds us to pray for his people,—they are ‘the house of the Lord our God.’ If we honor our God we desire the prosperity of the church which he has chosen for his indwelling.